Congratulations, Graduates! We know you're ready to take on the world! ODU Graduation has two parts, and we hope you will join us for both. Baccalaureate takes place as a Mass giving thanks for the blessings of our graduates, and Commencement is the official ceremony where graduates receive their diplomas. Apply for graduation, RSVP for commencement, buy your cap and gown, and more. How to get your tickets, where guests can park, photography guidelines and more. Share in your graduate's big day, no matter where you are! Also watch from the Student Center or Community Room. Graduating students may participate in the May ceremony if they will complete their degree requirements by May 11, 2019; or, if they are enrolled and anticipated to complete all degree requirements by Aug. 31, 2019. RSVP for graduation here whether or not you plan to attend the Baccalaureate and/or Commencement ceremony. RSVPs are required in order to purchase a cap and gown, walk in either ceremony and to ensure that you will have tickets for commencement. Deadline to RSVP for graduation is April 29. Please contact the Registrar’s Office (registrar@ohiodominican.edu) immediately for late applications or RSVPs. Tickets will be available for pick-up beginning May 6, at 11:30 a.m. If you have any questions regarding the status of your RSVP, contact the Registrar's Office at registrar@ohiodominican.edu. 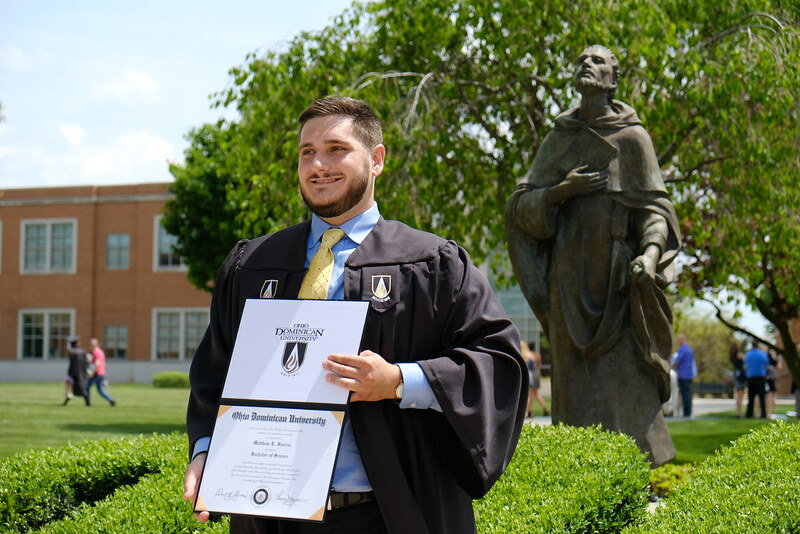 Baccalaureate at Ohio Dominican University takes place as a Mass giving thanks for the blessings of our graduates and of prayers for their continued success in life. Mass includes the traditional Baccalaureate sermon and may include other ceremonies. All graduates are invited to this Mass regardless of religious background. Your presence and participation are welcome and encouraged! Although communion is reserved to Catholics in good standing, participation in the Scripture readings, prayers, hymns, and intercessions is considered appropriate and is encouraged. Graduates may wear their robes to Baccalaureate. Continental breakfast will follow the service. Rehearsal is MANDATORY for all graduates. New Alumni Reception—ODU Grad Bash! Class of 2019, you've worked hard to earn your degree. Celebrate this exciting moment with your fellow classmates as you take these next steps from students to alumni! Appetizers, snacks and refreshments will be served in the Griffin Student Center. Graduates do not need to RSVP for this event—you're already on the list! Simply head over to the Griff following rehearsal.